Of limited interest to even residents of Staten Island and Woodbridge, New Jersey, but big news to me: the Staten Island Mall Bonefish Grill closed after little more than a year in business. Sad news (Carrabba’s, the previous tenant owned by the same company, fared no better–if a chain can’t even succeed on Staten Island) but the real story may be the poll conducted by the Staten Island Advance showing that 38% of locals wish Jose Tejas would replace the dead Bonefish. 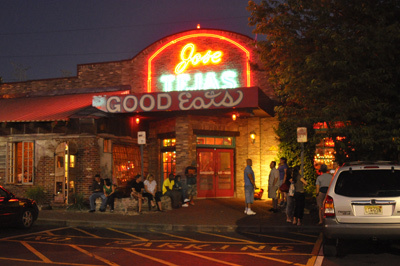 I’ve never been able to understand the wild popularity of Jose Tejas (and I was just there a few weeks ago) a Tex-Mex-Cajun restaurant that has an un-suburban wait for tables even on a weeknight after 9pm. The rock bottom prices must have something to do with it, but I’ve also speculated that diners might think it’s not a chain because the other branches go by Border Cafe. The Chevy’s down Route 1 is never full, for instance. And my theory has now been supported; the Advance just reported that Jose Tejas is not a chain.